It’s 1938: Will Schuster creates an incredible new superhero who wears red stockings and a big flowing cape. It’s 1939: Bob Kane creates a fearsome new superhero who dresses like a giant bat. It’s 1940: a brilliant young comic-strip writer named Will Eisner creates a dynamic new superhero who… looks like he works in a bank. Eisner’s newspaper editor is baffled. Questions… Where’s his costume? “Well, he’s got a hat, he’s got a coat, he’s got a tie,’ replied Eisner. Where’s his mask? 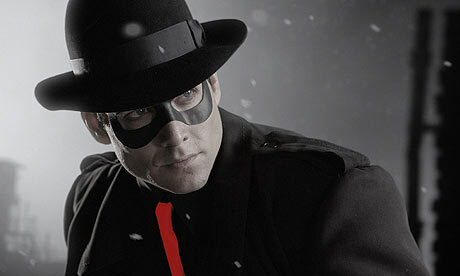 Eisner sighs, takes out his brush and puts a mask on him. Who exactly is this guy?